Edited by Suna F. Kiraç . Coronary artery disease (CAD) and its consequences are the most important morbidity and mortality reasons in the developed and developing countries. Advanced imaging techniques (intravascular ultrasound, MR and CT angiography, SPECT/CT, PET/CT, PET/MRI) and novel serologic biomarkers (C-reactive protein, interleukin 6, matrix metalloproteinase, P-selectin, intracellular adhesion molecule 1 and tumor necrosis factor ) provide early diagnosis of CAD and protect patients from hard cardiac events. Non-invasive techniques are being widely used in the diagnosis and management while conventional CAG is still the most commonly performed test in the cases at high risk. Following the first cardiac catheterization performed, first selective CAG has been reported at the end of 1950's. Patient specific and procedure-related complications range widely from minor ones with short term sequelae to life threatening events that may cause irreversible end-point if urgent treatment is not adequately provided. The important risk factors for complications are older age, renal insufficiency, uncontrolled diabetes mellitus, morbid obesity, and iodine allergy. However, operator skills and the type of invasive procedure being performed remain as the most important predictors to undesired outcomes. The risk-to-benefit ratio of the CAG should be considered carefully on an individual basis. Coronary CTA and CMRA among advanced imaging systems offer anatomical informations not only for coronary vessels but also for peripheral vascular structures, and assessment of the left and right ventricular functions is possible in same image series. Quantified coronary artery calcification and many post-processing images (2-D images and the different 3-D rendering images such as volume rendering, multiplanar reformation, partial maximum intensity projection, curved multiplanar reformation) should be evaluated to increase diagnostic accuracy. High calcification level signs atherosclerotic changes in the coronary arteries, but is not specific for luminal obstruction. Because the absence of detectable calcium deposition has a high negative predictive value for CAD, CAC value is a significant predictive determinant for prognosis in asymptomatic patients. 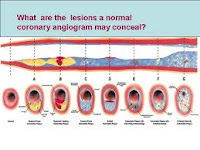 As with coronary angiography, myocardial perfusion abnormality may not be detected even there is coronary lesion causing a luminal narrowing of greater than 50 % defined by CTA and MRA. In asymptomatic and intermediate likelihood patients, assessment of myocardial perfusion by single photon emission computed tomography (SPECT) or positron emission tomography (PET) appears to be valuable even when coronary arteries are normal in angiography If gated study is added, left ventricular systolic and diastolic functions can be investigated simultaneously with myocardial perfusion. This field includes a overview of molecular targeted imaging, permeability of the coronary vessel wall, and interventional coronary MR. Recent developments in the field of ultrasonography have allowed us to objectively quantify global and regional ventricular function, and also, to get real-time evaluation of coronary walls and calcium load of atherosclerotic plaques. While we achieve more knowledge about atherosclerotic lesions by IVUS, tissue Doppler imaging has attempted us to assess myocardial function. On the other hand, radiation exposure is the most limited factor for CTA and MPS gated SPECT procedures and needs particular attention. Ionizing radiation doses, hazardous effects and general radiation protection principles should be known for optimal protection of the patients. Mainly radiation safety rules, various techniques and equipments that may be used to reduce patient and staff radiation exposure during diagnostic and therapeutic procedures especially cardiac interventional fluoroscopic procedures have been detailed discussed in this book. In this field cardiac MR, which is a powerful non-invasive technique for the simultaneously assessment of coronary artery anatomy and function, has a great promise as a radiation-free method. But, it currently lays behind CTA for noninvasive coronary angiography because of some limitation factors such as metallic implants and equipment design. Selection of the most appropriate diagnostic test in special situations such as chronic kidney disease (CKD) and diabetes mellitus is an other important issue. Although coronary angiography is a valuable tool, the major challenges with coronary angiography relate to when it is appropriate to perform and what the risks are associated with the procedure. Because renal function may be more and more impair with contrast agents used during CAG, and sometimes dialysis may be needed. Therefore, stress echocardiography, MRA and nuclear cardiac tests are often recommended to rule out the presence of CAD in those patients and the presence of any risk factor must be assessed on an individual basis in order to prevent for a soft or hard local or systemic complications. Contrast induced nephropathy (CIN) remains an important clinical issue in these patients, pre-treatment with theophylline combined with volume expansion using sodium bicarbonate; acetylcysteine; use of the lowest possible dose of contrast material (CM), and ISO-osmolar CM or low osmolar CM are advised to prevent CIN. Contrast induced nephropathy is diagnosed if a rapid renal dysfunction is occurred after CM administration without obviously any other cause of acute kidney insufficiency. Serum creatinine (sCr) is the standard marker for detecting CIN; however little changes in sCr after CM exposure may be seen but it is not considered clinically relevant. Therefore, glomerular filtration rate which usually measured by creatinine clearance is usually accepted as the most accurate method for the assessment of kidney function. But, even in patients with stable sCr the GFR may significantly be declined. Recently more sensitive markers (Cystatin-C and Neutrophilic gelatinase associated lipocaline) than sCr for GFR have been developed and validated. Cystatin-C is presented as more accurate marker than sCr for predicting renal function. Readers will get detailed discussions about advantages, disadvantages and possible complications of invasive and non-invasive cardiac procedures, and test selection criteria based on patient’s characterizations, mechanism and definition of contrast induced nephropathy (CIN) and preventive therapy models in one more chapters of this task. Consequently, this book summarized the clinics of atherosclerotic heart diseases, pathogenesis covering possible genetic factors and risk factors, a current view on new biomarkers as a diagnostic, prognostic parameters and future complications, novel diagnostic imaging modalities for CAD, and their advantages and disadvantages. Insight to molecular basis of CAD in a special chapter focusing on the role of on TRAIL (Tumor necrosis factor (TNF)-related apoptosis-inducing ligand) in the cardiovascular disease is really interesting and useful to understand how atherosclerotic plaques occur and what the importance of administration of recombinant TRAIL in protective therapy as a powerful approach.